There's an art to achieving the perfect social media picture. Jessica Koncz is a social media expert, App creator, millennial entrepreneur and runs an Instagram account showcasing drool worthy deliciousness with a following of 47,000. When Koncz started her Instagram at the age of 21, she saw the lack of social media presence for her favourite brunch spots, and with an eye for detail she starting snapping her favourite food. 'While glamorous pictures fill our feeds and make us envious of everyone else's plate, I always get asked about how we make our photos look so good" says Koncz. Jessica Koncz has built a business off people eating with their eyes. Creator of the Tinder for food App, Crave, Jessica has built a platform that encapsulates dish discovery. Jessica is the founder of Crave New Media a social media marketing and advertising agency located in Newcastle. They offer unique styles of content creation, videography and social media marketing for a portfolio of lifestyle and hospitality clients. 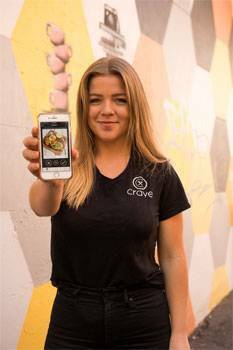 Jessica has also created Australia's first 'Tinder for Food" app, Crave and has a following of 47,800 on the Instagram page Crave Newcastle. Question: What is the Crave app? Jessica Koncz: The Crave app is a dish based discovery tool that enables users to discover new cafes and restaurants. 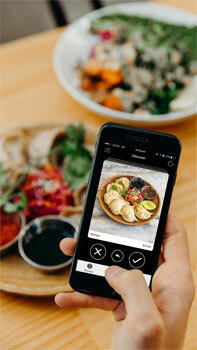 With the Crave app, users are able to swipe left and right through photos of dishes all personalised to their diet, location and budget. Crave is revolutionising the way customers discover food, giving businesses the ability to reach a targeted foodie audience. Businesses featured on the Crave app are able to advertise their business information and dishes as well as access analytics about dish performance, demographics, and more. Question: How can we get the Crave app, now? Jessica Koncz: Head over to the App Store or Google Play to download Crave! Question: Why did you decide to work with your brother on developing this app? Jessica Koncz: We looked into a few app development agencies but soon realised that this wasn't the direction we wanted to take. Conveniently my brother who owns a digital agency had a project free up and we engaged their services to collaborate on the project! Question: What difficulties surrounded working with family? Jessica Koncz: Absolutely none, having an app developer that you trust and is only a phone call or text away has been hugely beneficial to us. Question: You mention working with your brother was 'the business decision" you'd made; why? Jessica Koncz: Working with family is great, my brother was already immersed in Crave and we have a strong relationship which allows for a collaborative team environment. Question: How can we learn to target the perfect audience using paid content on Facebook? Jessica Koncz: The beauty of Facebook advertising is that you receive insights on who's engaging in your ad. Setting up multiple ad sets with different demographics allows you to see who is engaging in your content the most, from here you're able to clearly identify your 'target audience' and create ads to reach people that are actually interested in your brand or product. Question: How have you managed to create a work life balance? Jessica Koncz: The nature of social media is that the work is 24/7 and you're required to be 'online' outside of regular business hours. I absolutely love my job and as they say, if you find a career you love, you'll never work another day in your life. It's still important for me to 'switch off' at times, and that's why I have a great team to allow me to do so. Question: Can you share your top tips for taking the perfect food picture for Instagram? Jessica Koncz: Choose a colourful dish - If you're thinking purely about the aesthetic of the dish on your Insta then go for an option filled with colourful ingredients. Dishes like poke bowls, waffles or acai bowls are great choices. Get the lighting right - If you take a photo on a phone in a dark room, the quality is not going to be great and it most certainly will not be a beautiful addition to your social media feed. Bright and light is best and surprisingly the afternoon sun makes for a glorious shot (think cocktails, tapas and your favourite cheese board!) If you are cooking at home, set your shot up near a window for some natural light. If you're dining out, try and score a table outside that's not in direct sun to get the perfect pic. Stage it, don't fake it - The best shots often feature action. Try to get some shots while making a meal, pouring a drink or constructing of your favourite salad bowl. Never undermine the brilliance of a deconstructed dish! (Also never underestimate the value of portrait mode on the iPhone, hello professional content shooter). Buy or cook something you will actually enjoy - There's no point in cooking the cake if you're not going to eat it too! The trick? Post about the food you love. The greatest thing about posting on social media about food is about getting to indulge in the deliciousness afterwards. Try a GIF or a Boomerang - Friday night drinks anyone? Boomerang that. Post in on your story first, and if you love it repost it later on your feed. There's a range of apps and add-ons that you can use to enhance your social photos. Try a GIF maker or even VSCO to give your photos that sharper look. Lastly, be authentic about what you post. Didn't enjoy the food? Don't post about it. Love the food? Tell everybody! Your caption should accompany the image perfectly. You may not be a professional photographer but if you have a way with words it will make a difference to how your followers react.